Doubts remain over whether Europe has the right fundamentals to foster greater political integration. This column compares the attitudes of European citizens in a number of social and political areas, and finds that differences are no greater between countries than within countries. The real obstacle is not divergence of ideas and interests but nationalism, and the need to strengthen a common European identity, partly at the expense of national identities, is the most complex obstacle on the path of political integration. With the election of the new French President Emmanuel Macron, the question of whether Europe has the right fundamentals to move towards greater political integration, as originally envisioned by Winston Churchill and Robert Schuman, is once again gaining prominence. In the economic analysis of secession and integration, the answer to this question reflects a trade-off between the benefits of economies of scale and scope in the provision of global public goods on the one side, and the cost due to heterogeneity of preferences on the other (Alesina and Spolaore 1997). The first element of this trade-off – benefits from economies of scale and scope – is probably there at least in some policy areas. Among experts, there is a shared belief that areas of government intervention such as defence, foreign policy, and immigration policies would benefit from greater integration between European countries. These views are largely shared by European citizens. In a 2016 Eurobarometer survey, a vast majority of respondents declared themselves in favour of more European level decision-making in areas such as defence (80% in favour), promotion of peace and democracy (80%), environment (77%), immigration (71%), and energy policy (69%). There are also obvious risk sharing gains across EU members’ economies that could be strengthened. What about the cost due to heterogeneity in policy preferences? A widespread concern is that preferences and interests of European citizens may still be too divergent. To work effectively, political integration requires the formation of transnational political coalitions. But this, in turn, presupposes that attitudes and opinions of citizens do not diverge too much between countries that choose to integrate. Are European just too different from each other? To answer this question, in a recent paper we compare the attitudes of European citizens in a number of key areas (the role of the state and free markets in the economy, trust and tolerance of others, the role of the women in the family and in society at large, priorities in child education, etc.) (Alesina et al. 2017). The analysis covers the 15 EU countries in the period between 1980 and 2008, and thus excludes Central and Eastern Europe, as well as the effects of the recent financial crisis. Cultural data come from the European Value Surveys (EVS) –coordinated national surveys that ask the same questions repeatedly over time in all European countries. Our first finding is that, despite several decades of successful economic integration, divergence of views on these fundamental aspects increased over the past 30 years, both within and between European countries. This is surprising – one would have expected that increased trade in goods and services, increased mobility of people and more shared policy responsibilities would have led to more similar cultural attitudes between European citizens. Instead, the opposite happened. Roughly speaking, all Europeans became more ‘modern’ in their view of the world, but Northern Europeans did so at a faster rate than their Southern counterparts. Divergence in cultural traits was also accompanied by divergence in national institutional outcomes, such as perceptions about the quality of government and of the legal system, with Northern European countries improving relative to the European average, and Southern European countries moving in the opposite direction. A possible interpretation of these findings is that perhaps economic integration led to structural changes in opposite directions in Northern versus Southern Europe. But our most fundamental finding is that even though they grew over time, in 2008 the differences between European countries were still very small relative to the degree of heterogeneity observed within each member state. A Frenchman and a German taken at random display different cultural traits, as emphasised by Brunnermeier et al. (2016). But in our data this difference is only slightly larger (5-10% larger) than that observed between two French or two German individuals taken at random. And the same applies to any other pair of countries. This finding is illustrated in Figure 1. We can think of an individual respondent as a vector in the N-dimensional cultural space, and then compute cultural distances between pairs of individuals as the (Euclidean) distance between these two vectors (normalised to lie between 0 and 1). To remove heterogeneity in traits due to different socioeconomic conditions, such as age, gender or education, we can also compute distance between conditional cultural traits (i.e. after conditioning on socioeconomic observables). Figure 1 illustrates the distribution of distances between pairs of individuals sampled within the same country (the dotted line), and pairs sampled across different countries (the solid line). The left-hand panel refers to unconditional culture, while the right-hand panel removes the cultural effect of socioeconomic covariates. Data refer to 2008, the last wave of the EVS. 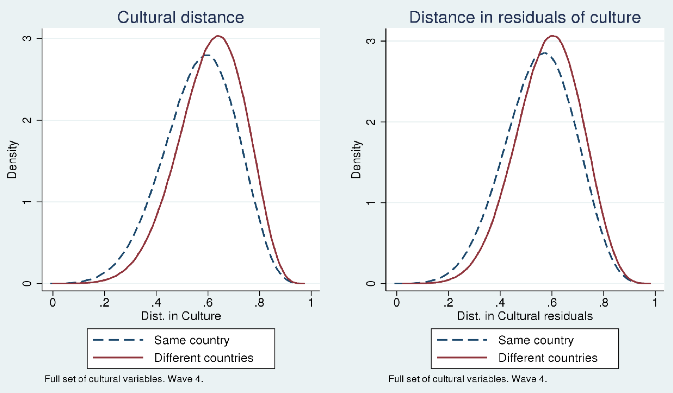 The distribution of cultural distances within and between countries are roughly the same. In other words, there is so much cultural heterogeneity within countries that the additional heterogeneity between citizens of different countries is negligible. The French presidential elections were a glaring example of this. The worldviews of Marine Le Pen’s and Macron’s supporters are probably more diverse than those separating many French and German citizens. And even in France, political divergences have a geographical basis. In the paper, we also compare Europe to the US. Even with respect to the US, Europe does not appear to be a divided continent. The cultural differences we see between the US states are more or less the same as those of the 15 EU countries (US data come from the Generalized Social Survey, which contains several questions similar to those used in the EVS for Europe). France and the US are advanced democracies that can reconcile their internal political divergences without compromising peaceful coexistence and the good functioning of political institutions. If differences of opinion among citizens of different countries are more or less the same as within each country, it is not heterogeneity of preferences per se that would prevent the EU from operating as a good democracy, at least in the areas of government where the benefits of integration are more obvious. The real obstacle is not divergence of ideas and interests, but nationalism. History, tradition, and language, among other things, induce citizens to identify with their nation and may amplify even very small cultural differences across state boundaries. This in turn may reduce the willingness to accept compromises, and makes it more difficult to form transnational political coalitions. Guiso, et al. (2009) show how this may translate in to mutual distrust. But we should not exaggerate the relevance of this hurdle, for two reasons. First, despite the EU crisis, citizens continue to feel themselves as Europeans, and not just members of their nation. Again, on the Eurobarometer of 2016, 51% of respondents claim to be both European and Italian, or French or German, against 39% who declare that they perceive only their national allegiance – more or less as in the 1990s. Second, national identity is not an immutable concept, but can be affected with education, but also with the habit of political coexistence. In this regard, how integration is achieved has very important effects on the diffusion of nationalism. Since the sovereign debt crisis of 2011, Europe turned to the intergovernmental approach in making common decisions. This made it possible to take difficult and very controversial decisions. But it also had the consequence of strengthening nationalist tendencies within each country, as national political delegation forced politicians to show that they ‘won’ and brought home a good deal. In short, how to strengthen a common European identity, partly at the expense of national identities, is the most complex obstacle on the path of political integration. And it is difficult to overcome it without abandoning the intergovernmental method and without attributing effective decision-making responsibilities to institutions elected by all European citizens, and not just the expressions of individual states. Alesina, A, and E Spolaore (1997), “On the number and size of nations”, The Quarterly Journal of Economics, 112 (4), 1027-1056. Alesina, A, G Tabellini, and f Trebbi (2017), “Is Europe an Optimal Political Area?”, Brookings Papers on Economic Activity, forthcoming. Brunnermeier, M K, H James, and J-P Landau (2016), The Euro and the Battle of Ideas, Princeton University Press. Guiso, L, P Sapienza, and L Zingales (2009), “Cultural Biases in Economic Exchange?”, Quarterly Journal of Economics 124 (3), 1095-131.